I am offering a new Keynote starting in 2013, first one is for a company called CarMedic (a Paintless Dent Removal National Company) January 4, in San Deigo, CA. This new Keynote is to help organizations leadership to understand how to incorporate an overall company strategy to use Social Media as the next big Communications Tool for not just their Marketing Department but for all Departments. Using Social Media as an overall company communication's strategy is oriented towards more listening, sharing personal items of the people behind the company, creating communities or clubs with their customers and prospects. Social Media is not only a communications tool - it is creating a cultural shift within and between companies. Just like when Microsoft Office and Emailing was introduced to the business world there was resistance and then acceptance due to their competitors were incorporating it - then Strategy & Training for widespread company adoption. 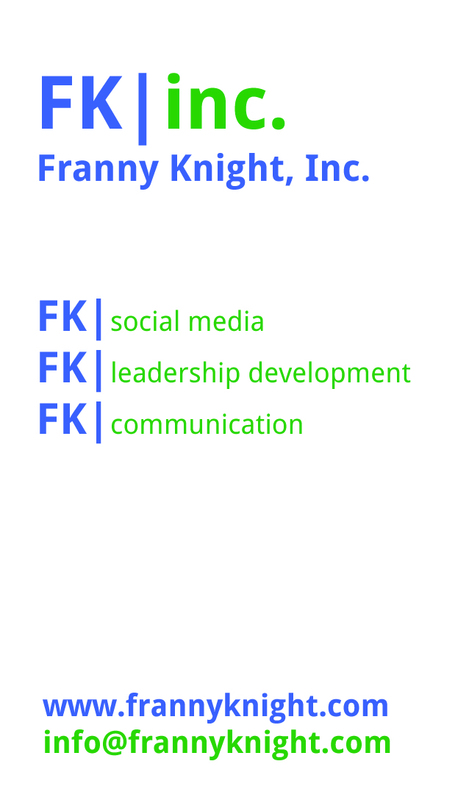 I will be offering this Keynote to Companies, Associations, Conventions, Meetings in 2013 as well as Consulting and Turn Key Social Media Strategy. Here is my Introduction for my upcoming Keynote. 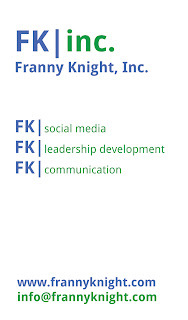 Franny Knight has a Master’s in Psychology, Doctoral Candidate for Behavioral & Transformational Change and owns FK Inc. a Human Capital Consulting Business helping organizations to grow through Leadership Development, Advanced Communications & Technology, Employee Engagement and Innovation. Franny believes that Social Media is an amazing communications tool set for companies to better listen and respond to their customers, vendors, suppliers and employees. It allows for radical transparency and personal information about the people behind the company. All companies are or will be strategizing how to incorporate Social Media into their Communications, Marketing, Branding, Customer Service and Employee Engagement just like when Microsoft Office and Email came on the scene. She believes we will be better companies because of it. I am manifesting more comments on my blog posts this year and an increased number 20,000 readers/followers.